The Board of Trustees’ Decision Regarding Building Names on Campus The Board has decided to rename two buildings and endorse two changes in Lee Chapel. President Dudley’s response in August to the report of the Commission on Institutional History and Community conveyed both the Board’s decision to retain the names of Lee Chapel and Lee House and our intention to discuss the naming of other campus buildings at our October meeting. 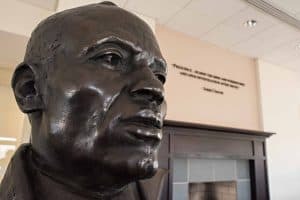 Robinson Hall will be renamed Chavis Hall in recognition of the first African-American to receive a college education in the United States. John Chavis graduated from Washington and Lee’s predecessor, Washington Academy, in 1799. Lee-Jackson House will be renamed Simpson House in recognition of the first woman to become a tenured professor at the university. Pamela Hemenway Simpson, who died in 2011, served as associate dean of the college and played a critical role in the university’s transition to co-education in the mid-1980s, chairing the Co-Education Steering Committee from 1984 to 1986.